Reinke, Tony. 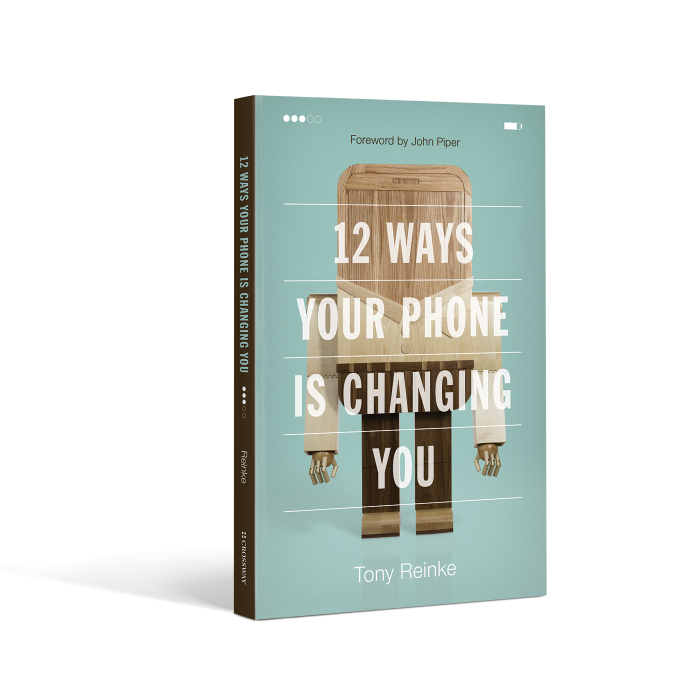 12 Ways Your Phone is Changing You. Wheaton, IL: Crossway, 2017. The road to this book review was a bit slow. I was given this book and had initially read the first few chapters but had to put it down to take care of more pressing matters. Recently, a friend had mentioned she finished the book and found it to be one of the most impactful books she read last year so I decided to pick it back up and finish it! Summary: The book is straight forward and essentially covers how the rise of the smart phone impacts our life and especially our spirituality. As a result, the book is comprised of 12 chapters with an introduction, conclusion, and epilogue. The book is saturated with research data on cell phone usage. These statistics are very interesting since they show hard evidence for the cultural impact that smart phones have made in our society. Technology is found all around us and sometimes technology’s contributions can be subtle; but the smart phone has major personal impacts. The book also provides several quotes from personal interviews on the topic of smart phone usage. These interviews are from pastors and theologians (e.g., DA Carson, Tripp Lee, Francis Chan, Matt Chandler, and more). Many Christian books do not have this feature and I found it quite helpful to hear the insights of godly men. The chapters are straightforward. The chapters address how smart phones have altered our lives and address: (1) distraction; (2) ignoring others; (3) craving approval; (4) losing literacy; (5) appeals to our consumeristic society; (6) create idols in our heart; (7) isolate ourselves and create loneliness; (8) opens the door to secret sins; (9) occupy ourselves with spiritual junk food / lose sight of what’s important; (10) we overstimulate ourselves and need to be current; (11) become insensitive through the impersonal communication of the internet; and (12) cannot redeem our limited time. The epilogue was devotionally driven. Reinke gives several practical suggestions on smart phone usage. He warns against the extreme approaches. While one extreme may encourage others to abandon the smart phone and go back to a dumb phone. The other extreme encourages others to embrace smart phones and all the apps that come along with it. I appreciated the balance and suggestions he gave to help us understand the proper place a smart phone can have in our lives. Comments: While the book was mostly driven by data and cultural observation I believe the contents of this book will be relevant for our generation. It may eventually take a backseat to whatever will replace the smart phone, but the core struggles Reinke addresses are universal and can be applied to the general advancement of technology. Addressing the issues of loneliness, illiteracy, isolation, and bad stewardship of time (to name a few) are struggles humans will always have. Reinke’s choice to structure the book as a chiasm was interesting (he explains it on pages 189–90). At the center of the chiasm he had chapters 6 and 7 that address love for God and love for man; the greatest commandments. That was an interesting literary twist I did not see coming. It really shows the kind of thought that Reinke put in to writing this book. If the aim of this book was to change the way I think about and use my cell phone, then it was extremely successful. It has already led me to some practical changes in my day-to-day use of my phone and will likely lead to more. The book provoked some thoughtful reflection and helped guide me in making wise decisions on cell phone usage. Recommendations: I would highly recommend this book for a wide array of people. First, I think it would be helpful to give teenagers (or kids) prior to receiving their first smart phone. The book addresses some relevant issues to culture and theology. The discussions on sexual purity and the desire to be noticed through social media are all relevant to what they will struggle with as smart phone users. Next to those entering into the smart phone world, millennials need to read this book. The smart phone is a problem the millennial generation has, does, and will continue to struggle with. This technology driven generation could learn from taking a step back from their phones and digest the impact it has on our social lives and spirituality. I would also recommend this to people who spend a lot of time on their phone. Sometimes our phone usage is justified. People can provide a number of excuses, “I use my phone for work,” “I stay at home all day and have nothing better to do, so why not?” “I accomplish a lot of spiritual good through my smart phone usage,” “I get my news from my smart phone, what’s the difference between this and reading the paper?” and so much more. Whether you know you have a problem or not, this book will expose our proper and improper uses of smart phone technology. Lastly, I think this book is most helpful to any Christian living in the first world. Smart phones are so common in first world contexts. In the west, people spend hundreds of dollars on their cell phone and often upgrade their phones. Having a smart phone in the modern world feels like a necessity. Literally, I don’t think I have come across anyone lately who doesn’t have some kind of smart phone. Therefore, I wouldn’t be surprised if the contents of at least 1-2 chapters of this book would be convicting.